Bladder stones are collections of mineral crystals that combine together in the urinary tract. They can cause discomfort and lead to more serious problems that require the care of a veterinarian. 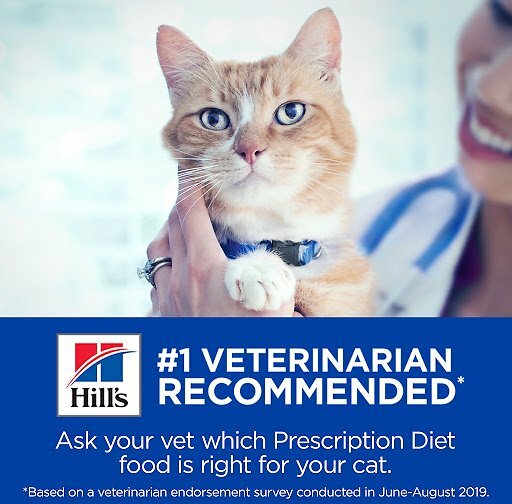 Hill's nutritionists and veterinarians developed Prescription Diet s/d clinical nutrition especially formulated to support your cat's urinary health. In fact, s/d is clinically proven nutrition to dissolve struvite stones in as little as 6 days (average 13 days). Adjust feeding amounts as necessary to maintain optimal weight. If you are unsure, ask your veterinarian. For best results & safety practices: Cover and refrigerate unused portion. Gradually transition to your pets new food over a 7 day period. Exclusively feed the recommended Prescription Diet dry food & canned food. Keep fresh water available at all times. Have your veterinarian monitor your pets condition. 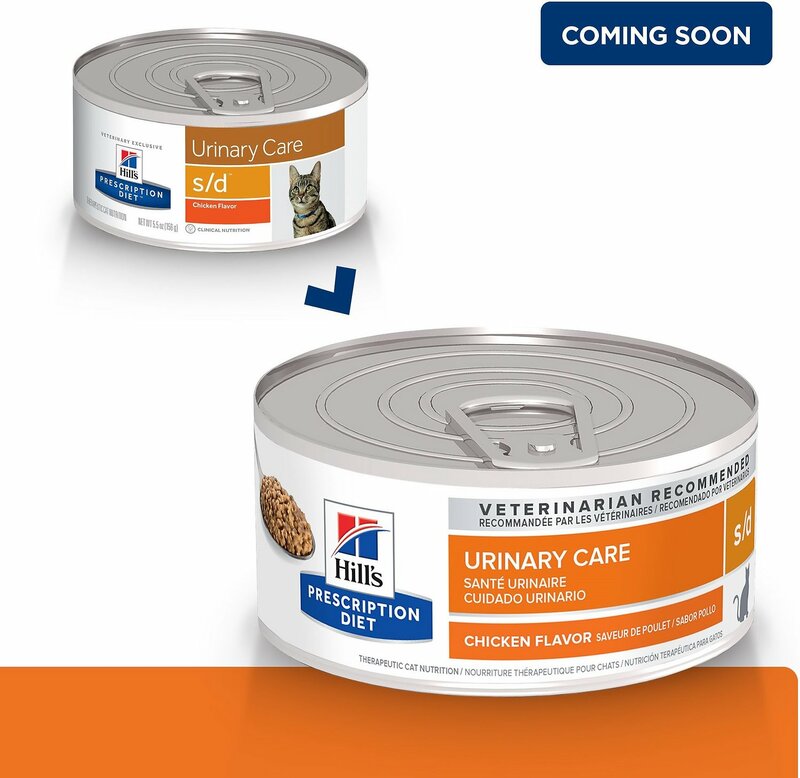 Hill's Prescription Diet Urinary Care foods give you effective options for managing your cat's urinary health. Prescription Diet c/d Multicare dissolves struvite stones in as little as 7 days and reduces the risk of struvite and calcium oxalate stones. Prescription Diet s/d reduces the risk of struvite stone formation and supports a healthy immune system. These foods offer both dry and canned foods, in a variety of flavors, to support your cat's urinary health. I had another cat of mine on this food 15 years ago. You would think after all these years and the amount of money they charge: 1) They would make prescription food a cat will want to eat because they are sick and REALLY NEED TO EAT so they don't die or need expensive surgery; 2) Make a variety of flavors so you maybe can find one your cat will eat. I have 2 cats the other one walked over, smelled the food and walked away too. My Cats did not like. I'm sorry but the kitten I purchased it for would not eat it, even disguised in other food. The rest of my cats didn't like it either. Even my stray cat who thinks he lives here didn't like it. 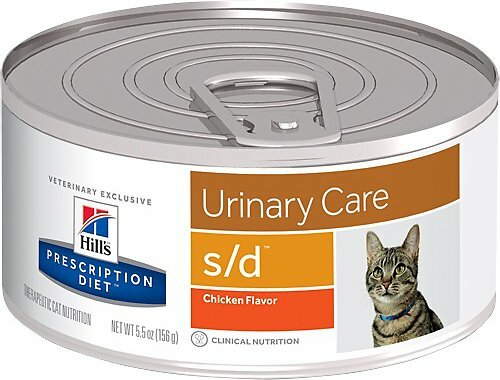 My vet put my cat on this food both the canned and the dry version. He is OK with the dry version, but he LOVES the canned food. When I open the can for him in the morning he practically leaps on the counter to get it. I hope eating this solves his urinary tract problems. 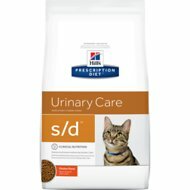 One of my cats was prescribed Hills s/d after being diagnosed with struvite crystals. Three weeks on this diet and her symptoms are gone and she seems to be feeling much better. We will be taking her for a re-check to confirm her progress but we are confident that this food has done it's job. Phantom's improvement is remarkable and she loves both the wet and dry Hill's Prescription Diet. It works but you must be diligent. We've had two different kitties on this food for bladder stones at our sanctuary. It's not their favorite food but we mix in one teaspoon of their usual wet food (Against the Grain) and they dive right in. We also add a small amount of distilled water to everyone's food for extra hydration. If you can't get your cat to eat as is, try mixing in a tuna based food to up the temptation factor. This food is KEY to dissolving bladder stones but it does take time and you MUST follow-up with vet rechecks to make certain the stones are dissolved. This food has worked for us on multiple occasions and saved our kitties from flushing or surgical procedures. It worked on the stones. Not my cats favorite but I have mixed a small amount of they regular food and water then they ate it. And it worked so far no more crystals or stones. Tiger my one year old tabby had a serious urinary tract problem & will have to be on a special diet the rest of his life. He's not loving this canned special food, but he may eventually eat it if I leave it out long enough. He was used to eating lots of different brands & flavors of foods so this was a bit of a disappointment to him. I hope he will learn to like it more over time. Have just started our cat on this product so we don't know how effective it will be. At least he likes the taste of it! Were very happy with the speed of delivery too. Since they have to be on this food I was happy that they like it and licked to bowl clean. My cat has to be on this for another month and can be expensive. chewy helps to ease the cost.